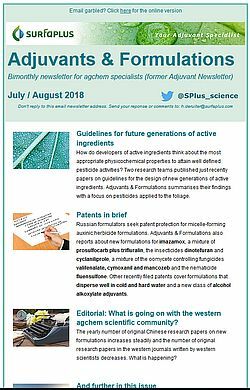 Would you like to stay informed about the latest we published in our magazine Adjuvants and Formulations, than sign up for our free Adjuvants & Formulations email alert (see below the subheading Subscription to Newsletters). This email alert service gives you a foretaste of the latest news in each issue (for an overview of previous email alerts click here). Click on the picture below for the June/July 2018 free email alert.